Unusual older thick restaurantware hand painted mug made by The Wallace China Co. Looks like it was done in California, or Hawaii with the decorative palm tree and the sailor. If your name is Jim, and you were in the Navy in 1962, this mug is for you! Excellent condition. 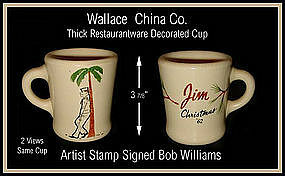 Signed Wallace China~California, and also Bud Williams~456 South "D" St.~Tustin, CA. Nice Military collectible and really is excellent quality and condition for 45 plus years old!